Radulphus received his land from Gerard de Furnival, his father-in-law,[ii] who had just inherited the Lordship of Hallam through his marriage to Maud de Lovetot. It is interesting to note that the shields of Rudulphus de Ecclesall, Gerard de Furnival and the de Mounteny family differed only in their colours – Arnold de Mounteny had married de Furnival’s elder daughter, while Rudulphus had married the younger. Each son-in-law was given land adjoining the Furnival estate and castle – perhaps as a dowry- Arnold receiving Shirecliff (later Brightside) and Rudulphus receiving Ecclesall; deemed by David Hey [iii]to be the two most important sub-manors in Hallamshire. (see map below). The Manor of Ecclesall estate was a wedge-shaped piece of land with a boundary formed by the Sheaf, from Heeley bridge up as far as Limb Brook, which it followed to the present day Round House, then north along the moors to the source of Porter Brook, in Mayfield Valley, then down the Porter as far as the Moor. 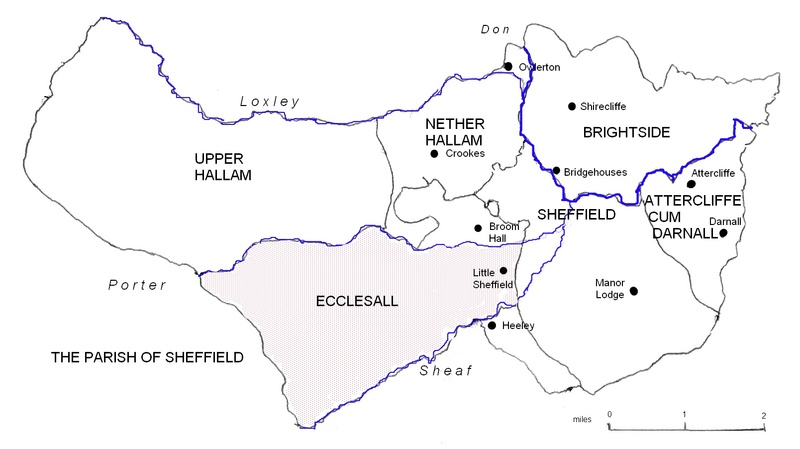 The estate was one of the six ‘townships’ that made up the parish of Sheffield, which, together with the parishes of Bradfield and Ecclesfield made up de Furnival’s Lordship of Hallam. Sadly, only two more generations bore the title ‘de Ecclesall’ and in 1329, the last Sir Robert granted all his lands to Joan de Wanton. The Manor in which the family lived, stood in Joce Park, but more of that later. [i] The information relating to the de Ecclesall family is taken from Hunter’s Hallamshire London 1819, which, in its turn, cites references from Pegge’s A Historical Account of Beauchief Abbey 1801. [ii] See Rotherham web Pedigree of Furnival Lords of Hallamshire. Click HERE to return to the Mill main page.